I like to approach the inner journey of working the all Steps from an 11th Step perspective. In my sobriety Steps 6 and 7 are where I experience the most personal growth and self improvement. Slowly I whittle away at reducing my defects ad the negative effects they have on my life and my relationships. Once we have taken an inventory of our resentments and fears, and have learned to begin to be honest and detach ourselves from these feelings and we are at the starting line to make a commitment to remove our defects of character. My defects of character are the tools that I’ve used to help create the present condition of my life or my Spiritual Garden. In the unseen world of spirit and energy, I imagine that I am constantly preparing the ground, sowing seeds, allowing trash and weeds to accumulate, feeding and watering my Spiritual Garden with my thoughts, emotions and actions. Thoughts are things. There are positive and productive tools that we can apply to improve our lives and the condition of our Spiritual Gardens. The Twelve Steps of Alcoholics Anonymous are wonderful examples of the spiritual gardening process and our 11th Step meditations help with the inner work to improve our lives from the inside out. Meditation application of Step 6: We identified the root cause of our defects, learned to detach from them and to view them from a new spiritual perspective. Here is a Step 6 Guided Meditation – Uncover and detach from our defects. It is approximately 17 minutes in length. This brings up several questions for me that need to be addressed to help me understand this step in its proper perspective. Am I ready to have God working in my life? This is an example of how we are constantly applying the actions of the third step through the steps and our lives. Every moment is a Step Three decision moment for me. Do I turn left to follow my old ways and habits, or do I make a right turn to step away from my defective habits and towards God? Am I willing to bring my “entirely readiness” of Step Six to each present moment to remove my defects? To be honest…probably not. Only when a defect is creating new wreckage of the present do I become more ready to take action, once again. If we develop the concept that we are Spiritual Beings having a human experience, we can imagine that defects of character are all of our thoughts, emotions and actions that we have created to prevent us from living as pure Spiritual Beings. As our SpiritSelf, True Self, or Higher Self we are one with each other, our world, the universe and with God. In Step Two I like to imagine that my Higher Power, God, is love. This energy is the root of the entire Universe and that as a spiritual being I an expression of this love in action. At the time of our birth, we are living as our SpiritSelf, pure expressions of love, observing and interacting with the world through innocent perception. Our experiences and environment begin to overwhelm us as we interact with people and situations and we learn to act and feel in ways that contradict our true natures as Spiritual Beings. I forget that I am connected to and always in the presence of God. My ego develops in reaction to conditions and experiences as I grow. We begin to feel separate and alone, losing our natural connection to God and the Universe, in the same manner, just as we are dis-connected from our mothers at birth. Defects of character can be viewed as any thought feeling or action that does not express our spiritual nature. Our defects are rooted in fear and our fears are rooted in our sense of separation from God. When we meditate and focus on a oneness with God we feel a sense of peace and calm. When we forget our divine connection we become afraid and act in ways that we think are protecting us from all that we are afraid of. So, we miss the mark or fail to hit the target of expressing our Spiritual nature when we express a defect of character. 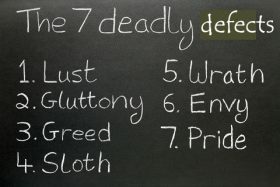 Some of the most common categories of sins or defects are lust, pride, greed, envy, anger, sloth and gluttony. What are character defects? ….. and what are their Spiritual opposites, virtues, that we can strive towards as a goal? “I am the Love of my Higher Power in action.” You may substitute any word for the spiritual quality or virtue that expresses the opposite of the defect into this affirmation. Repeat it over and over with in rhythm with your breathing in your meditation. You may wish to add a visualization to accompany the affirmation that reinforces and imprints the energy of the quality within you. In this way we begin to weed out the defects within our Spiritual Garden and replace them with the fruits and flowers of our virtues. 1. Pride – A sense of one’s own proper dignity or value; self-respect. Arrogant or disdainful conduct or treatment; haughtiness. An excessively high opinion of oneself; conceit. It’s spiritual opposite is humility. Seeing ourselves as we are and not comparing ourselves to others is humility. 2. Greed – An excessive desire to acquire or possess more than what one needs or deserves, especially with respect to material wealth. It’s spiritual opposite is generosity. Generosity means letting others get the credit or praise. It is giving without having expectations of the other person. 3. Envy – A feeling of discontent and resentment aroused by and in conjunction with a desire for the possessions or qualities of another. It’s spiritual opposite is love. Love actively seeks the good of others for their own sake. 4. Anger – A strong feeling of displeasure, hostility or impatience with the faults of others. It’s spiritual opposite is kindness or goodwill. Kindness means taking the tender approach, with patience and compassion. 5. Lust – An overwhelming desire or craving, the self-destructive drive for pleasure out of proportion to its worth. This is what we often call “obsession.” It’s spiritual opposite is self-control or moderation. Self-control and self-mastery prevent pleasure from killing the soul by suffocation. Blessed are those that are moderate. 6.Gluttony – Excess in eating, drinking, entertainment and other legitimate goods, and even the company of others. Its spiritual opposites are faith and temperance. Temperance accepts the natural limits of pleasures and preserves natural balance. Faith is trust that all that you need will be supplied. 7. Sloth – a repulsion of work or exertion; laziness; indolence. When we live a life stuck in our LowerSelf, our defects of character combine to deaden our spiritual senses. We grow slow to respond to God and eventually drift into a spiritual slumber. It’s spiritual opposite is Zeal. Zeal is the energetic response of the heart to God’s commands. In the Fourth Step we are shown how we are often “angry, indignant, self-pitying and incredibly dishonest. Driven by a hundred forms of fear, self-delusion, self-seeking and self-pity, we step on the toes of our fellows and they retaliate. Selfishness – self-centeredness! That we think is the root of our troubles.” This vividly describes the alcoholics life of missing the mark and creates the foundation for our defects.! Who do the defects of character belong to? I can’t help it, I’m just lazy. It’s my nature to be impatient. I just can’t focus for very long. I get distracted easily. I’ve had a quick temper all my life…it’s just the way I am. As we are learning through the steps and our meditations with the Steps, we have learned to identify ourselves with our PersonalSelf, our bodies, emotions and our thoughts – our ego. We have moved away from our remembrances of our SpiritSelf, our oneness and connectedness to God and the rest of the universe. We have learned to identify who and what we are by our emotions, our habits, our defects of character, rather than as our SpiritSelf. Robert Assagioli, one of the founders of the Transpersonal Psychology movement wrote a book, The Act of Will. Transpersonal psychology is a form of psychology that studies the transpersonal, self-transcendent or spiritual aspects of the human experience. To me, this is what we are working to accomplish by working the Steps through meditation – to transcend our PersonalSelf to reawaken or actively connect with our SpiritSelf. In his book, Assagioli provides exercises that we can use in meditation to dis-identify with our egos, or PersonalSelf, and to discover the spiritual “I” of our SpiritSelf. The metaphor that I like to use for this concept is that of a basket. Imagine that there is a basket sitting on a table. This basket is our PersonalSelf, our ego, thoughts, emotions and physical body. As we collect life experiences, habits, things we think are important to us, stuff, attachments, we put them in our basket. Our basket becomes who we think we are, what we identify as us. Our ego identifies with “What I have,” “What I do,” and “What others think of me.” But the items in our basket are temporary, not a part our spiritual beingness, our SpiritSelf. This higher self aspects of our being embodies the qualities of wisdom, courage, love, goodness, honesty and is inter-connected with our Higher Power and everything in the Universe. “I have a mind, but I am not my mind. It is more or less developed and active; it is undisciplined but teachable; it is an organ of knowledge in regard to the outer world as well as the inner.” But it is not my SpiritSelf. I have a mind, but I am not my mind. For me, the process of uncovering and working to let go of my defects is a long-term sobriety effort. Usually a specific defect becomes prominent in my awareness and causes me an increasing amount of pain. When the pain is too great and I need relief, this is when I begin working in earnest to remove or lessen my attachment to the defect. My defects are literally hard-wired into my brain via the neural pathways, and there is much energy built around this habit over the many years that my defect has lived within me. Most likely this defect of character was given birth when I was very young in a time of fear. The defect became my tool to relieve my of the stress or fear, or to protect me. But now that I am gaining a new perspective on life I can understand that the defect is not really a tool but a hindrance to my spiritual growth and to my sobriety. In SpiritStep Five we practiced honesty and seeing through the illusions that we create for ourselves. SpiritStep Six continues with practicing to see ourselves as we really are. This requires that we learn to detach ourselves from our PersonalSelf. Our defects of character belong to our PersonalSelf and are reactions to the illusions that we perceive through our thoughts and emotions. We wear our defects of character like layers of clothing to protect us from the many fears that we have created over the years. As we slowly, or quickly, choose to shed these layers of defects we begin to feel lighter and free from the emotional baggage that we have carried for all of these years. Usually we have to reach an emotional crisis to realize that a specific defect is creating pain in our lives and that it is unmanageable before we are entirely ready to remove it from our life. But, we do not have to wait to be in pain in order to begin choosing to let go of our defects of character. In our meditation for this step we will practice an exercise that helps us to detach from our PersonalSelf and to begin to identify with our SpiritSelf. We begin with our usual preparatory steps to enter into a conscious connection with our Spiritual Self and God. Here is a guided meditation that you may wish to try that will help get your started. This is recorded and embedded in the webpage for to you listen to above. “I have a mind, but I am not my mind. It is more or less developed and active; it is undisciplined but teachable; it is an organ of knowledge in regard to the outer world as well as the inner; but it is not my SpiritSelf. I have a mind, but I am not my mind.